Interested in a career in law enforcement, government, firefighting or the medical field? Want to earn real experience —- and a paycheck — while preparing for a gratifying career? Read on. 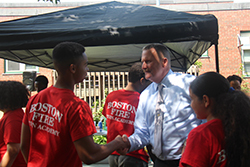 If you’re a Boston high school junior or senior age 16 to 21, we encourage you to apply. You’ve faced serious challenges in life, and you want to move forward. Find a career that’s in sync with your interests and allows you to give back to the community. Through the Future Protectors Initiative, ABCD and key partners offer a paid part time position during the summer and the school year. You can earn high school and college credit through dual enrollment; earn First AID/CPR and OSHA 10 certification; partner with a mentor in your desired field, and gain access to other ABCD programs and services.